Before the days of shopping malls and music stores, many folks made music with items they found around the house. My mother played a pair of spoons. Irish folks played two wooden sticks, called bones! Down South, and especially in the Cajun area of the United States, folks turned a washboard (also called, scrub-board or rub-board) into an instrument. If you’re lucky, you may be able to find an actual old-fashioned washboard around your house. If not, you can often find them at yard sales, flea markets or in your grandparent’s attic. If not, check out the directions to make a homemade one below. 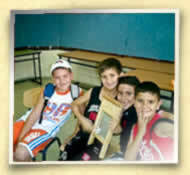 In Cajun country, the wasbboard is most often played with thimbles placed on your right or right and left hands. If you don’t have thimbles or find them hard to hold (they are slippery! 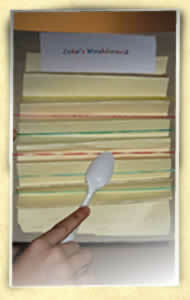 ), I recommend plastic spoons or forks or sporks as they sound good and are much easier to hold. You can also try playing with a chopstick, an unsharpened pencil a plastic hair pick or an egg whisk. Each will make a slightly different sound. 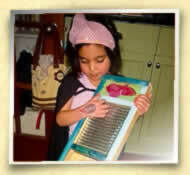 Try playing by rubbing down the washboard, rubbing up the washboard, or tapping the top or bottom of the board with your thimbles or spoons. Then mix up the sounds. For instance you can play this pattern and it works really well with the song “Oh Susannah”. Slide down – slide up – slide down (repeat). Once you get the hang of it, start making up your own patterns, or play along to your favorite songs or to songs in DARIA’s cd section. You will sound terrific in no time at all! Although this may not be as sturdy as a good old-fashioned washboard used to clean the family’s clothes, you can still make a simple rub-board from a heavy piece of cardboard (like from the back of a tablet of paper), a manilla file folder, a stapler and a handful of rubber bands. Along with these items, you’ll probably want some plastic spoons or unsharpened pencils to use as scrapers as well. First, take your manilla file folder and cut off the uneven edges. Then begin to fold it as if you were making a fan, creasing the manilla paper back and forth. Then open it up and cut it to fit on your cardboard. Staple the top and bottom edges firmly leaving room for the ridges to stick out. 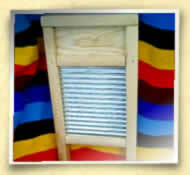 Next, place the rubber bands in each ridge to secure the washboard area in place. You may wish to personalize your rub-board with the child’s name (this is great as a classroom activity) and then - go ahead and play!